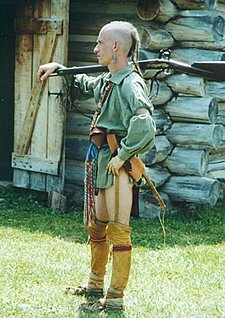 During the American Revolution - 1775 -1783 - frontier forts played an important role. The frontier could be a dangerous place. With no police force for protection, settlers often built forts for refuge in times of threat. Native Americans, sometimes angered by the presence of settlers on lands they had used for generations for hunting and fishing, were known to threaten settlers. On other occasions, men might leave to serve in local militias, and forts were a place for families to wait in safety for their return. The American frontier was a wilderness full of forests, animals, and enemy soldiers. During the revolution, the frontier extended from central New York and Pennsylvania southward through Virginia and into the Carolinas. There were only a few trails that headed westward into these areas, and forts were important for the safety of settlers who were otherwise completely alone.